The world of KYPRIS has taken over my skincare routine, big time. I think I kind of knew, I felt an instant chemistry with the brand with its enticing philosophy; which led me in getting all three of the serums at once. Each of them complements each other and even become a good pairing for other skincare products from different brands too. This particular serum from the brand makes me me fall in love head over heels and it’s the fastest serum I’ve used up in quite a while. It’s saying something considering I adapt my skincare routine accordingly to my skin’s needs but this one happens to fit in most of it, if not all. It is the KYPRIS Antioxidant Dew. 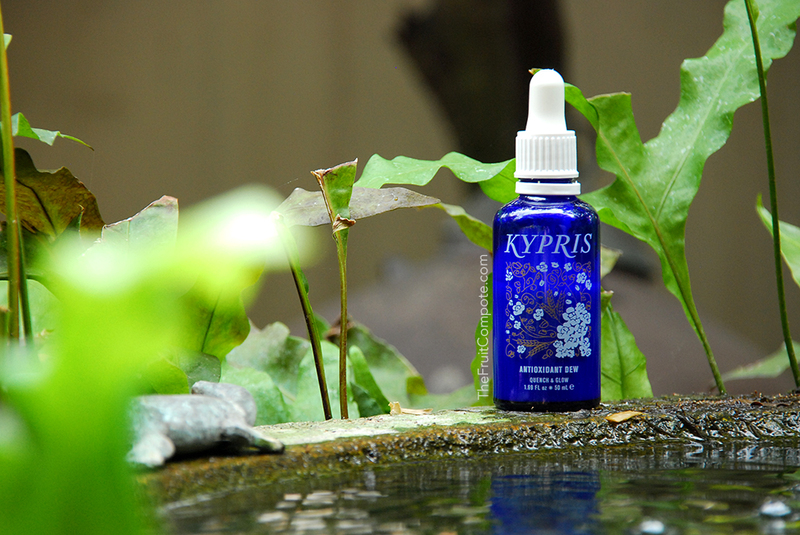 KYPRIS Antioxidant Dew offers “a long soft kiss of hydration“. That alone, is a romantic poet for the skin. The name itself sings to me. It promises to restore hydration, vitality, and dewiness with four distinct forms of antioxidant, phospholipids, and a host of nourishing botanical love. Vitamins A, C, E and Superoxide Dismutase are encapsulated in phospholipids to challenge free radicals and nourish the skin’s barrier. Sea Algae Extracts to hydrate the skin without overwhelming the pores. Two distinct varieties to Rose Extracts (Rose Damascena and Rose Centifolia) to soothe, calm and bring resilience. Oat Beta Glucan for nourishment and anti-irritant to diminish inflammation. Foraha Nut Oil known for its ability to repair the appearance of blemishes and encourage cellular regeneration. Borage Seed Oil to soothe and nourish the skin while maintaining the moisture for a supple complexion. The best part about KYPRIS Antioxidant Dew is we can use it as a serum (of course), a lightweight moisturizer or as a layering piece in the skincare routine. Layering piece, you say? Now we’re talking the same language here. If any, I’ve been wanting to find a hydrating serum that I can layer with my other serums. Something that can play and get along well with others. The serum has a milky white, lotion consistency and quite runny. It spreads easily across the skin and absorbs beautifully, leaving my skin very supple and soft to the touch. It has a very calming natural scent, nothing obnoxious. It smells really humble. I just want to drench myself in it. I love Antioxidant Dew for its versatility. It goes well with literally every single serum I paired it up with. I have layered it over with its sister Clearing Serum, Sunday Riley Luna Oil, Aurelia Revitalize & Glow Serum, REN Resurfacing AHA Concentrate, and many others. I can insert this in possibly every single skincare routine, day and night, I kid you not. I do admit that I use this often as a second serum to add hydration. One might think, is it not good enough as a stand-alone serum? Yes, it is a lovely serum on its own and does everything it says. But after layering it over with other serums, it’s hard not to. I’ve stated countless times about the importance on keeping my skin hydrated because otherwise, the skin will not reach its best potential. I don’t believe that there’s one do-it-all product. This is exactly why we combine and customize our skincare routine, mix and match, adding elements accordingly to our needs. Antioxidant Dew provides extra hydration that I know I need and in doing so I also find out it boosts and improves the overall quality of my skin. The other great thing about Antioxidant Dew is how stunning it is when I mix it with the the brand’s Beauty Elixir. 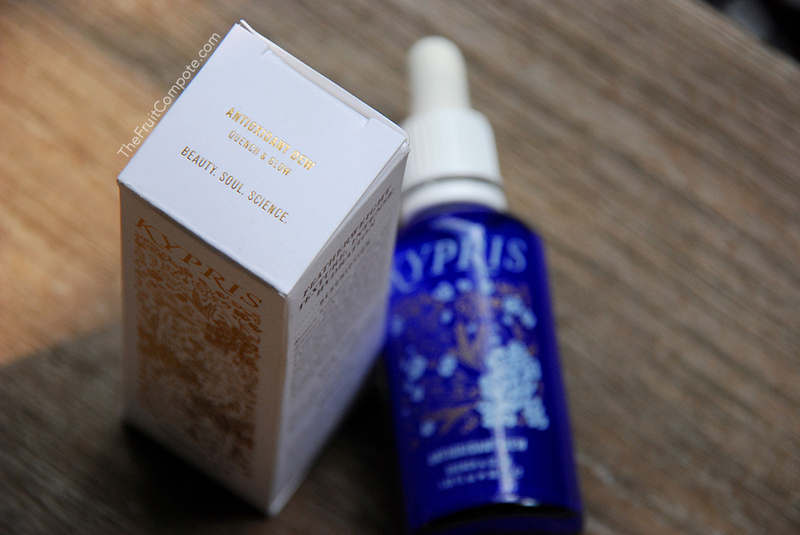 Chase Polan, the founder of KYPRIS, calls it a micro emulsion. It’s by far my most favorite way of using this serum. I’ve mentioned this technique several times in my previous reviews. It’s the simplest way yet the most effective of making both of the serum and face oil to reach their utmost potentials in benefiting the skin. Logically speaking, serums’ formulation are designed to sink into the skin quickly. 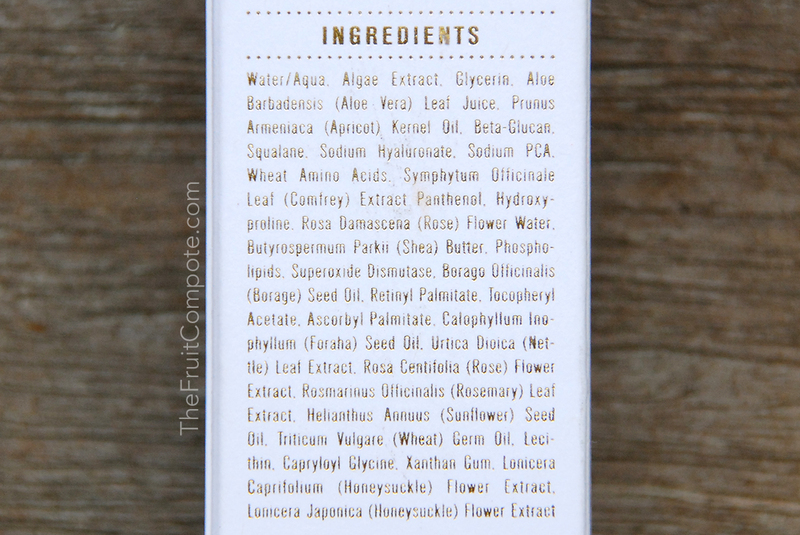 Face oil is best applied when there’s an element of water. Be it dampen skin or mixed with water (I do the latter). By combining the two, the watery element in the serum will bond the face oil and get absorbed into the skin together. So imagine, we get the best of two worlds in one simple motion. Genius! To put Antioxidant Dew back into the perspective, when applying a micro emulsion, I get all the beautiful quenching, free radical fighters into my skin alongside with the powerful, nourishing face oil while still giving a layer of moisture on the surface. Keeping all the goodness inside. With this (or micro emulsion in general), I rarely feel the need to apply another moisturizer on top, because the face oil is enough. If I was feeling indulgent though, I might add an overnight sleeping mask. My favorite ratio is 5 drops of the serum and 2-3 drops of Beauty Elixir II (usually just two because it’s oh-so-precious). That’s enough for the whole face and neck. I mix the two on my palm, using my finger. Smooth it over the skin while massaging it gently. Enjoy the process while giving myself compliments. It sounds silly but being positive enhances the whole holistic experience. The finish these two creates is IMPECCABLE. It’s soft, it’s dewy, it’s luminous. Ever since I started incorporating KYPRIS Antioxidant Dew regularly in my skincare routine, I realized this has become the backbone, a major support in the betterment of my skin. My skin feels and looks a lot more suppler, more resilient and not as cranky. The soothing and calming elements play a big hand in helping my skin to cope living in a tropical country, specifically in this polluted city of Jakarta. I loved carrying this when I travel but a leaking incident got me wary. For some reason the cap won’t close properly. Nevertheless, this is great as a travel companion. The formula will help the skin to bounce back post-flight and keep it well attended when home is afar. Prior making this review, I even stopped for a few weeks just to make sure I am not hallucinating with how I feel. My skin was alright, no funny breakouts. But darn it, when I started wearing it again, waking up in the morning became a constant reminder of why I love this serum. Frankly speaking, with a quarter left I started to ration and use it sparingly. I will finish this up though so I can get a new, updated formula of this serum. I bet it’s going to be just as beautiful, if not more. For a serum that seemingly looks rather simple, I am obsessed. P.S. as mentioned, my Antioxidant Dew is the older version. KYPRIS has launched an updated formula. To know the difference, please check the website. Never Forget – Inner Corner Highlight!